I love appetizer potlucks. You can throw together something quickly and you don’t have commit to a big cooking expedition (or cooking at all!) That is exactly how I discovered this amazing flavor combination. My friend brought a version of this appetizer to my house and I seriously fell in love with it. 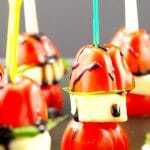 This Caprese salad skewer with balsamic reduction is by far, my latest and greatest favorite appetizer. Okay, I admit that it’s been almost 2 years since that appetizer potluck, but it takes a lot to impress me when it comes to appetizers and I have made this one every single time I’ve needed an appetizer in the last two years. That says a lot! It’s quick, easy, vegetarian, gluten-free and you can make it ahead or right before your event, if you only have a short time to spare. We often have an appetizer extravaganza on New years eve and we try to keep it healthy. This recipe will definitely be joining the ranks this year. 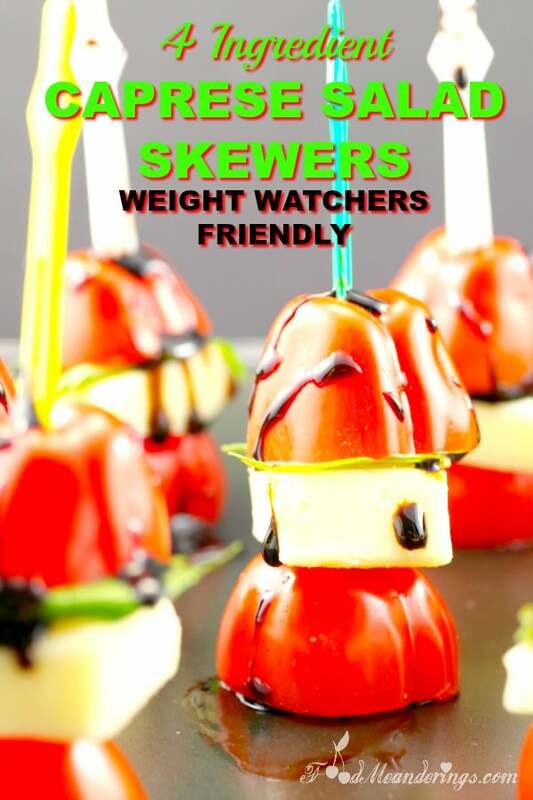 So, if you are looking for a New Year’s eve party appetizer, especially if you are following Weight Watchers, this one is perfect, clocking in at 3 weight watchers smart points for 2 skewers! You don’t have to wait until New Years Day to enact your healthy eating resolution -this appetizer will help you start of the New Year right! 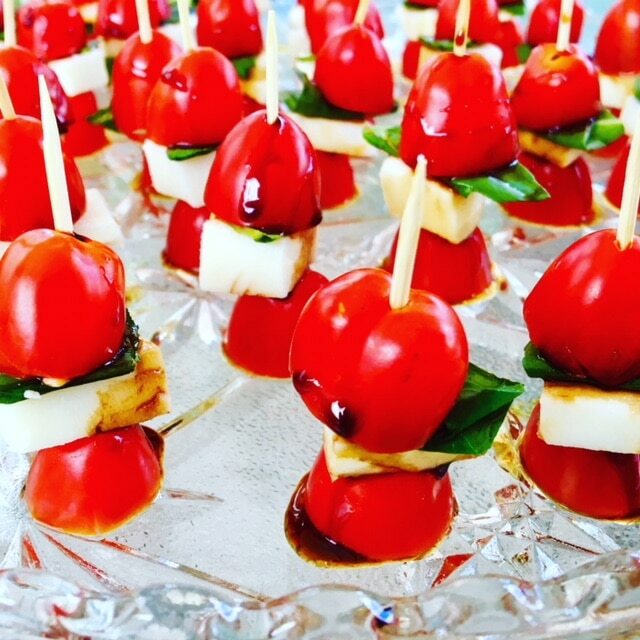 I make mine a little different from how my friend made it when she introduced it into my life 🙂 My Caprese Salad skewer is on a toothpick and uses grape tomatoes, cut in half (or cherry tomatoes). I also slice the mozzarella any old way – I don’t do it in circles or perfect symmetrical squares – it’s completely fuss-free. I made these this summer for an appetizer at a small family get together and they were a huge hit! It’s the 11th hour here (day before we leave for Christmas holidays) and I didn’t have time for my usual fancy photos, so in keeping with the no-fuss theme, (what it’s really all about right now, at this stage of the game anyway), the first photo is a quick shot I took of these Caprese salad skewers on my Mom’s old skool crystal serving tray when I made them last summer. 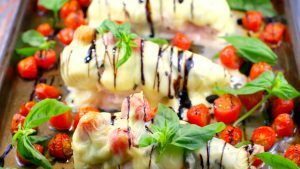 These tomato, basil, mozzarella skewers, drizzled with a balsamic vinegar reduction are healthy, low calorie, weight watchers friendly and won’t leave you overdrawn at the calorie bank. 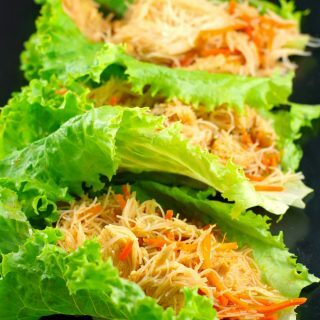 So, if you are looking for a fantastic quick, healthy and easy appetizer, try this one! AND if you love this flavour combination as much as I do, give my 5 Ingredient Caprese Sheet Pan Chicken Breast a try. This delicious and healthy appetizer was the inspiration behind this tasty Sheet Pan chicken breast recipe. I love these serving trays! This healthy, simple and delicious 4 Ingredient Caprese Salad Skewer appetizer is make-ahead or perfect for a last minute gathering, especially if you are trying to stay on track with your health goals. At only 3 weight watchers smart points for 2 skewers, these salad skewers will help you keep on track! Slice mozzarella into squares. Add small square of mozzarella to skewer. Fold piece of basil and add to skewer. 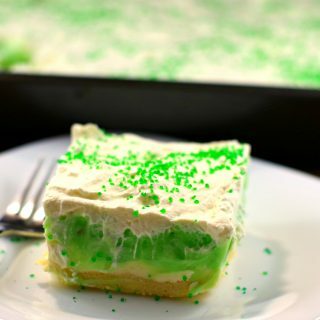 If you like this recipe, please PIN IT~! Previous Post: « Leftover Turkey, Cranberry & Brie Panini: Holiday dinner leftovers are the best! Quick, easy and always popular! Everyone loves these tiny bites on a stick! These look right up my alley. No fuss is just the way I like it. I ate captese salad daily in Italy. So delicious and balanced the gelato nicely. There’s nothing quite like the simple combination of ingredients that make up a caprese. It’s always so good, and it really emphasizes the quality of the ingredients (which always makes me happy). Very nice to see a new and interesting take on presenting this classic. Cheers. These are so cute and such a fantastic idea for entertaining! Beautiful post!